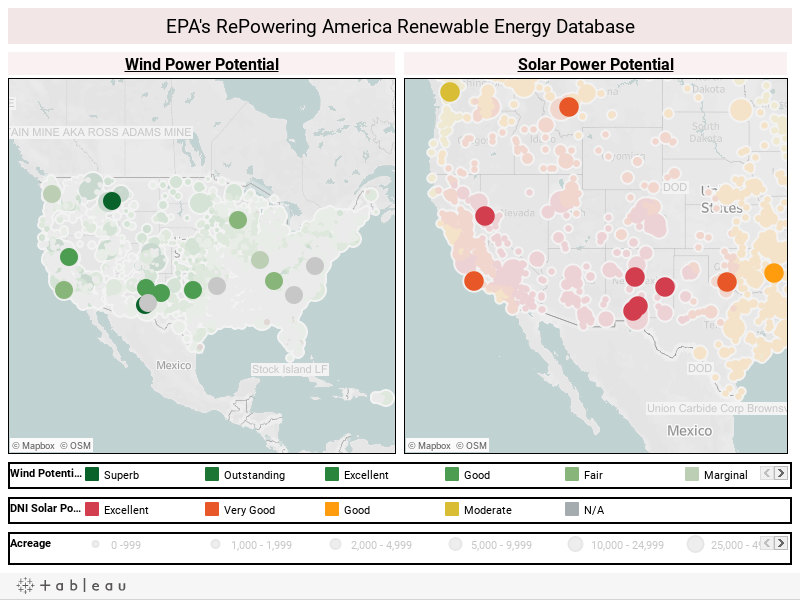 The visualization below uses EPA’s data ( sites > 10 acres) on solar energy potential for sites, wind potential of landfills, brownfield, Superfund, abandoned mines and other sites and EPA programs. I created this tool using Tableau Software to create an interactive visualization to explore the diversity of sites and get information on site acreage and DNI solar potential. Zooming in is easy – go to the bottom of the map and select the pointer tool. To zoom out again, click ‘Ctrl’ and the mouse pointer simultaneously. Unfortunately, there are few sites in California and the Southwest of a size to support commercial scale solar power except sites on U.S. military lands. Using the legends at the bottom, you can select and view only large or small sites, excellent wind power sites, the highest solar potential sites, and EPA programs individually.